Just outside La Paz, Mexico, Costa Baja Resort & Spa has upped the luxury ante in a region of Baja California still delightfully undiscovered. Costa Baja Resort. ©Ellen Barone.I’d been running full throttle for months when my husband, Hank, and I booked a pre-cruise stay at Costa Baja Resort & Spa in La Paz, Mexico. Somewhere between preparations for a year (or more) of nomadic wandering in Central and South America (more soon!) and looming deadlines, I decided that a pre-adventure respite in a luxurious resort would be the perfect place to kick back for a few days. There are many who mock a resort stay (too mainstream, not for serious travelers)…for the very seclusion I was hoping to find. There’s something about exquisite service, tranquility and gracious hospitality that soothes a life-exhausted soul. From the moment they checked us into our room hours before the ‘official’ arrival time, Costa Baja turned out to be the perfect pre-cruise hideway. Beautiful, comfortable, friendly and attentive, the staff, surroundings and accommodations were all that we’d hoped for. Costa Baja Resort. ©Ellen Barone. We had come to La Paz to host a photo-themed adventure yacht cruise with American Safari Cruises, our third sailing in Mexico’s nature-rich Sea of Cortes (a.k.a. Gulf of California), in addition to other Baja explorations, so we knew La Paz fairly well. It’s a delightful place with a beautiful seaside malecón (waterfront promenade), fabulous food and a laid-back rhythm - safe and far removed from mainland troubles. This trip, however, we would leave exploring La Paz for after the cruise. Pre-voyage it was silence and solitude we wanted - and the resort provided plenty of it. At Costa Baja, Hank and I indulged the tempo of resort living: we slept late, lingered over meals, read, swam, sunned, and enjoyed the intimate company of one another. With its cutting-edge marina, Gary Player Signature Golf Course, beachfront villas, custom homes and condominium development, Costa Baja is more than a hotel. With an extended stay visit, or future boat charter, in the back of our minds, we toured the resort facilities, filing away the possibilities into our ever-expanding travel idea bank. There’s nothing like the jingle of rigging and water lapping on hulls in a marina, where sleek yachts glisten beneath a languid sun, to set our hearts to dreaming. Over the years we’ve often entertained the dream of adopting a seafaring lifestyle and cruising our way around the globe - and the state-of-the-art Costa Baja marina had us dreaming big. So far, however, the joys (and expense) of boat ownership have eluded us. And truth told, it was lucky that our stay at Costa Baja was pre-cruise, or we might have been tempted…. Part of a 550 acre development, CostaBaja™ Resort and Spa is just 10 minutes south of La Paz, the capital of Baja California Sur. 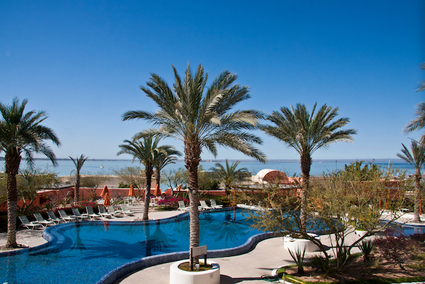 The resort is set on the magnificent Sea of Cortez overlooking a 250-slip double-basin marina and white sand beach. The development comprises privately owned vacation villas, residential golf homes, waterfront condominiums, and a 115-room hotel. Learn more at www.CostaBajaResort.com. Carretera A Pichilingue K.M 7.5 | La Paz | Baja California Sur | 23010 | Reservations: (877) 392-5525 (worldwide, toll free). Doubles from $199 US. Also available, all-inclusive Scuba, Golf, Snorkel, Fishing and Spa packages. American Safari Cruises specializes in authentic, active, deluxe cruises and charters on three luxury yachts. Itineraries focus on close-up viewing of wildlife, fine dining, and activities such as kayaking, beachcombing, hiking, snorkeling, sailing, and exploration by motorized inflatables. Each of the yacht charters and cruises are all-inclusive, so all premium wines, microbrews and liquors, exclusive shore excursions, on-yacht meals, activities, taxes, port charges, transfers and lectures are included. American Safari Cruises offers an alternative to traditional large- and small-ship cruises by taking guests into areas that are not accessible to larger ships, and on private excursions and activities unavailable to independent travelers. Learn more at www.AmericanSafariCruises.com. Destinations: Alaska, Columbia and Snake Rivers, Hawaii, Mexico’s Sea of Cortes | 3826 18th Ave W, Seattle | WA 98119 | Reservations: (888) 862-8881| from $4,995.